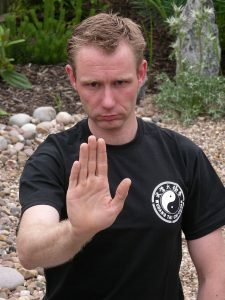 I started studing Tai Chi Chuan in Nottingham in 1997 with Gordon McGowan at the YMCA. Gordon left the YMCA after only 6 months and his senior student, Peter Ellis, took over from him. I studied with Peter in Nottingham until 2008. 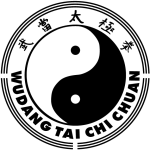 I took an instant liking to Wudang Tai Chi Chuan. I loved the range of aspects to this martial art and was taught in a nice relaxed, non regimented manner; it didn’t have all the belts/gradings/expense of other martial arts. Very quickly I was going to classes three times a week. I studied with Peter and his Tai Chi brother, Andy Harris, for about 11 years. During this time I won a bronze medal at the British Tai Chi Chuan Championships, under the tutelage of Andy Harris, around 1999. In 2008 Sifu Ellis left Nottingham and asked me to take over the Nottingham Tai Chi Chuan School. So in 2008 I took over 3 different classes of his, at three locations in Nottingham, looking after about 30 of his students. It was tough and I had to quickly brush up on everything to make sure I understood what I needed. I travelled down to London to meet with his master, Dan Docherty, to ask if I could teach and was awarded a Level 4 certificate. I taught his classes for 18 months, before myself, becoming a father, also left Nottingham destined for the Derbyshire Dales. No offence Nottingham – seems like everyone leaves you at some point! After 4 years of struggling to find a teacher of my own again, and trying other martial arts (Aikido & BaGua), I finally opened Amber Valley Tai Chi Chuan in 2014. The school has gone from strength to strength and now classes are run on Tuesdays and Thursdays. I have a lot of time for my students, they are all really nice people and “obviously” the ones who keep coming back are very committed. My students range from about 35-60 years old and are about a 50/50 split of males / females. The school opened on June 1st 2014 and initially started out on Tuesday evenings only. Last year (Nov 2016) I was diagnosed with cancer. I had a 3cm tumour in my throat. I was booked in at Derby Royal to start Chemotherapy and Radiotherapy to annihilate the tumour, starting in Jan 2017. I went to see Dan Docherty and he awarded me a level 5 certificate after a weekend of assessments. Then the treatment started. It was tough, and once it really kicked in, I had to stop teaching. Classes continued nevertheless. The students kept coming and training on their own. 8 weeks later I was back. This time I was adamant that MORE Tai Chi Chuan classes were needed. I needed to do more Tai Chi Chuan and I thought my students needed more options for training in the week. So I started up a Thursday evening (1st April 2017), in addition to the Tuesdays. I strongly believe that daily practise of Tai Chi and QiGong, helped me to stay calm, fight the cancer and get better afterwards more quickly. The illness was completely out of the blue and the doctors said it was just plain unlucky. I was fit and well otherwise. I got the all clear 6 months later. I’ll never stop doing Tai Chi Chuan. I believe it saved my life and that it will continue to keep me well, fit, healthy and alive. In Nov 2017 I went to Hong Kong to meet with Cheng Tin-hung’s youngest son, Cheng Kam Yan. I met with him twice and trained with him. He was like a rock. It was a great experience and a real thrill to train with another “high up person” in the Wudang Lineage, in the backdrop of Hong Kong. You can see the Wudang Tai Chi lineage here. Tai Chi Chuan is so good for you as an all over body conditioning system and a seriously clever martial art, that I want others of all ages to share in the experience. I teach all aspects of the Wudang syllabus; the weapons, the handforms, a few different QiGong sets, the push hands drills, self defence applications and am interested in everything about this amazing art form.